I was recently invited to participate in a project called Early Works, conceived by Photo Lucida. It’s 1979 and a weekend trip to visit my grandparents on the south coast of Britain. The location for our Sunday outing is the Arundel Wildfowl Centre, described as a “haven for wildlife in a picture-book setting in West Sussex, bordered by the River Arun”. It doesn’t look particularly picturesque in this photograph. There’s my grandfather wearing a hat and brown suede jacket. I can’t tell for sure, but I’ll bet he’s also wearing a shirt and tie. He was always immaculately turned out, even after he retired from his job in the bank. Around his neck hangs a leather case containing a pair of binoculars. He’s not looking at the birds, but at me (and you), with a slightly austere, quizzical expression. Although I’ve cut his left leg off, it’s a pretty well composed photograph for a five-year-old. My brother features prominently in the centre of the frame, wrapped up on this winter’s morning in a padded red coat and blue cord trousers. The colours of his clothes have faded little in the years since the print was made, in contrast to the bleached autumnal hues of the trees and slight yellowing around the rim of the photograph. My parents crouch either side of my younger sibling. 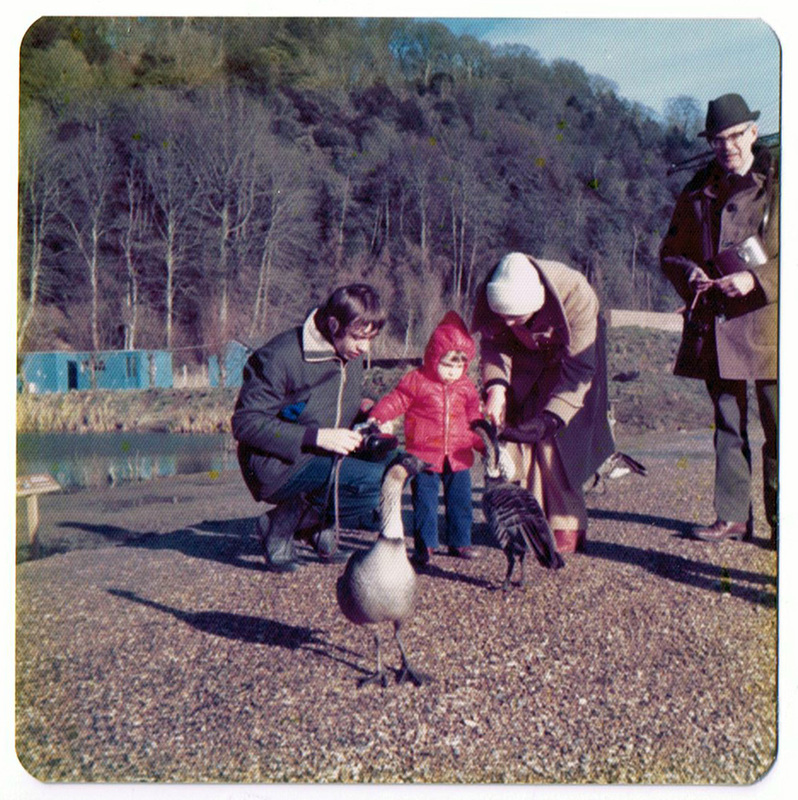 Mum appears to be helping him feed scraps of bread to the geese, while Dad’s attention is focused on his camera. It’s possible he’s just loaded a new roll of Kodachrome 64 – his film of choice – or that he’s fiddling with the exposure. He was a keen amateur photographer and his passion for the medium certainly rubbed off on me. At first glance the photograph represents an ordinary middle-class family scene, but on closer inspection an element of tension appears under the surface. Is one of the geese about to peck my little brother? There’s a good chance I took this photograph hoping that would be the case! I didn’t like my brother much in these early years. He was born on my second birthday, thereby competing for my parents’ attention and subjecting me to a childhood of shared celebrations. It’s strange looking at the picture now, in the age of Instagram and camera apps, which re-create the nostalgic feel of ‘old photographs’ – using elements such as the square format, rounded edges and tinted colours as seen in this thirty year-old print. The photograph has an almost contemporary feel.